I LOVE steel cut oats – but don’t love the long cook time on busy mornings. A few years ago I discovered Overnight Steel Cut Oats and was hooked. However, sometimes I wake up with a craving for steel cut oatmeal and didn’t prep any the night before. 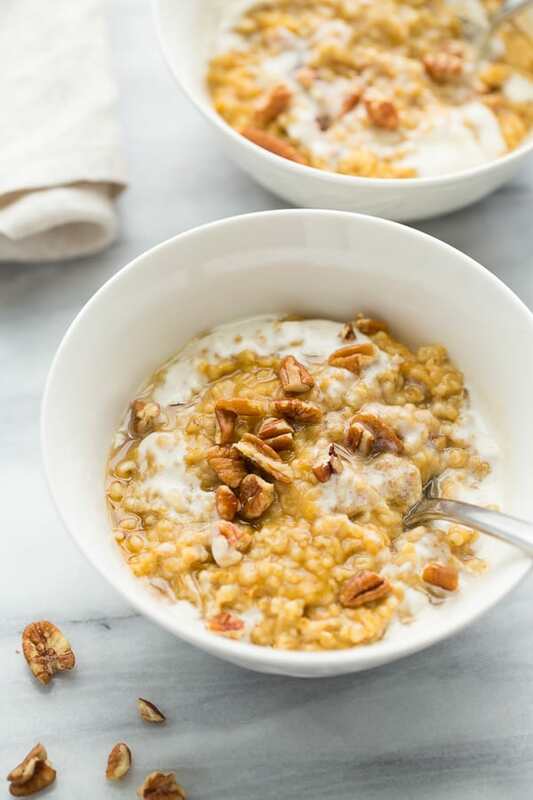 For mornings like these Instant Pot Steel Cut Oats have come to the rescue! 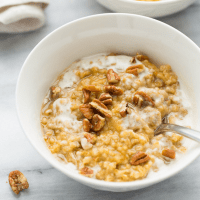 I love making steel cut oats in the instant pot because they turn out perfectly creamy and soft, but the whole cooking process is totally hands off. No stirring or worrying about pots over-boiling with starchy water. 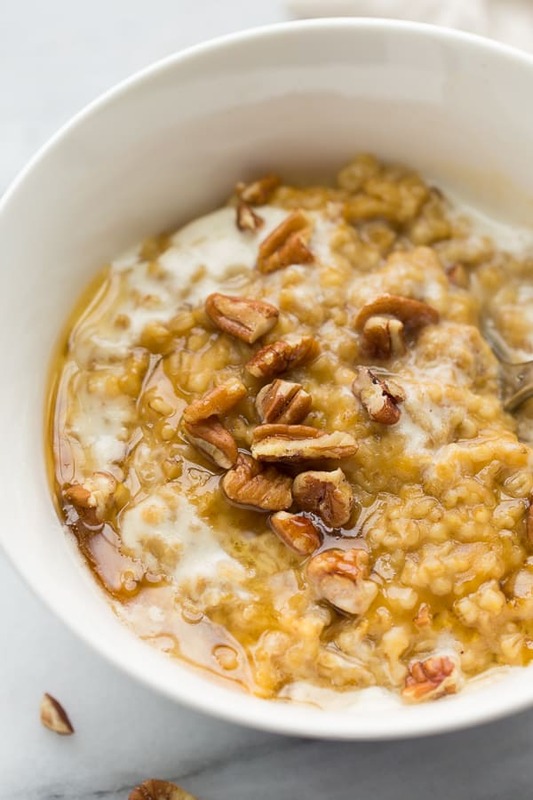 My 6-year-old declared this Creamy Pumpkin Maple Oatmeal the best oatmeal ever. I agree! It almost tastes like rich and creamy rich pudding. It has the perfect hint of sweetness and all the flavors of fall. I like to serve it topped with toasted pecans and a drizzle of homemade cashew cream (or a splash of almond milk). I use canned coconut milk for this recipe because it makes the oats extra creamy, but still totally dairy-free. Lately I’ve been buying coconut milk at Trader Joe’s. Either regular or light coconut milk will work great. These are my favorite gluten-free steel cut oats. My family of 4 can eat this whole batch with no leftovers – so double the recipe as needed! 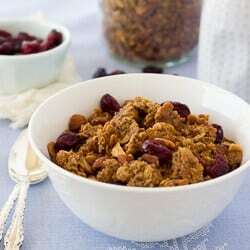 You will love this easy hot breakfast! In the pot of a 6-quart instant pot add the oats, coconut milk, water, salt and vanilla. Close the instant pot lid. Press MANUAL and set timer for 10 minutes. When the 10 minutes of cooking are up, let the oatmeal natural release for at least 12 minutes before releasing the pressure. Stir in the pumpkin, maple syrup, brown sugar (or coconut sugar) and cinnamon. Serve topped with almond milk and chopped pecans. Enjoy! 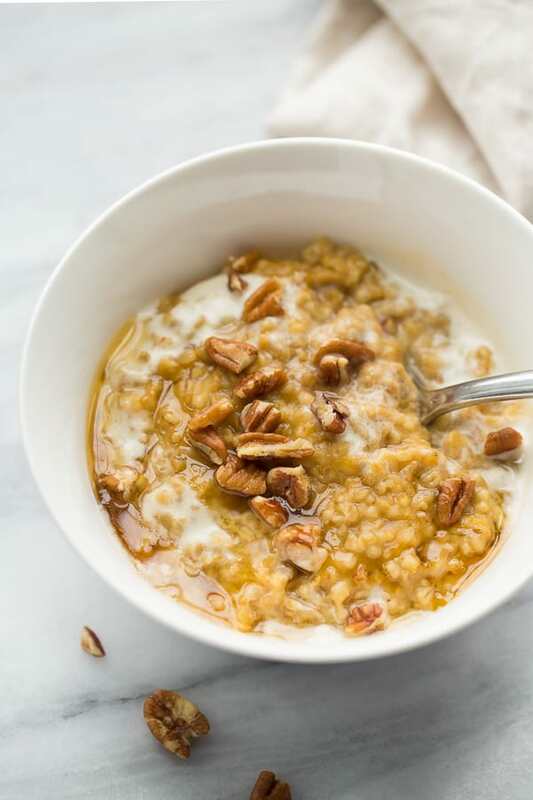 The cooking process for this oatmeal is totally hands off - but it takes time for the instant pot to come up to pressure. The oats also turn out best if you let the instant pot natural release for at least 12 minutes. I would plan for 30 minutes start to finish for this oatmeal to be on your table. I’m allergic to coconut and was wondering what a good substitute would be. Thanks! This doesn’t say whether (after hitting manual) whether to choose high pressure or low pressure. It would be nice to include other cooking methods , stove top , slow cooker . Instant pot maybe all the rage but a lot of people don’t have one. If you double the recipe does the cooking time change? And do you have a nutritional fact list? Made this and it was so good. I doubled the recipe and followed the instructions and it turned out perfect. I’m so glad it worked out for you! Thanks for the comment! Should the sealing valve close? Mine never did. Steam was rising the whole time. Can you use gluten free oatmeal instead of steel cut oats? Are the ratios of other ingredients still the same? I haven’t tried this myself but a friend did! She said to decrease the cook time to 5 minutes then 10 minutes natural release. I hope that works! I would’ve given this 5 stars, but here’s the thing…the salt. Oh my goodness! 1/2t salt was waaaay too much! Is it possible that the measurement listed was a typo? I make oatmeal and always add salt because I think it does make a difference, but this was over the top for me. I would cut the salt easily by half. As yummy as the other flavors were, and they were, the only aftertaste in my mouth right now is salt. Still and all, I gave the recipe 4 stars because I have no doubt when I make this again sans a ton of salt, it will be perfect…because everything else really was! The oatmeal was hot and creamy with just the right amount of sweetness and spice. I’m actually going to make another batch of this without any salt and combine the two so I don’t waste this pot. This recipe warms you from the inside out. Great flavors! Wow! This is really good! I didn’t have coconut milk, so I used half coconut cream and half water instead. It was easy since I doubled the recipe and could use 1 can of each. Then, I proceeded to follow the recipe as is. Delicious! I made this for my 9 month old son and stored it in the freezer. He loved it. I now want to double the recipe so i can have some for the rest of the family but also store his. If I double it do i need to adjust the time or does it stay the same? DELICIOUS!! I made it as noted* (including 1/2 teaspoon salt), and the flavors were perfect. *I’m not dairy free, so used 2% milk in place of the coconut milk. 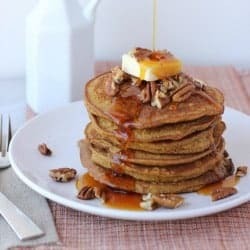 * Drizzled with unsweetened almond milk and topped with pecans. Very satisfying breakfast! I’ll try with applesause (in place of pumpkin) sometime, too. Thank you for the great recipe! Just made this and it absolutely delicious!